Our next essay, titled "The Extinction of Experience," was written by a well-known nature writer as part of his book The Thunder Tree: Lessons from an Urban Wildland. Robert Michael Pyle was born in Denver in 1946 and now lives in Grays River, Washington. He received his B.S. and M.S. degrees from the University of Washington, and his M. Phil. and Ph.D. from Yale. 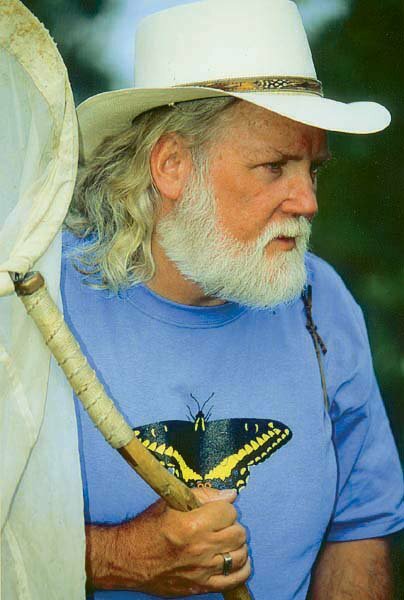 He is a respected lepidopterist who wrote The Audubon Society Guide to the Butterflies of North America along with a number of books about nature. To learn more about Robert Michael Pyle, watch this 15 minute video interview by the North Cascades Institute. Thank you for sharing your blog, G Van Horn. I really like the way you describe Pyle's essay in your own words. If I may borrow from your blog page to share here: "It’s not that exotic animals in foreign lands aren’t important. In the grand scheme of things, they matter deeply. But contact, real contact, is what leads to relationship. Borrowing a page from ecologist Aldo Leopold who wrote, 'We only grieve for what we know,' Pyle lays his point out plainly: 'People who care conserve; people who don’t know don’t care. What is the extinction of the condor to a child who has never known a wren?' " Beautifully summarized. This theme of the emotional importance of species and habitats that are perhaps not the most ecologically important is a thread that runs through Betsy Hiestand's "Zip-A-Dee-Do-Dah", our first essay. In a way, Pyle's writing completes the circle for this read. We welcome your thoughts on our upcoming posts - thanks again for sharing your blog with us. I guess my question addresses both Pyle's and Hiestand's essays...How could you NOT act? I'd say keeping every piece of every puzzle (or every fish) in this world of ours is impossible..just like keeping every story alive is impossible. But keeping the ones that connect to others, and the 'border pieces' is the only way to see a bigger picture. Yes, we can argue over which pieces, but the goal is always the same--Preserve our source of 'fish'...our wisdom...our stories...our skimmers and pelicans for the future. Most people will do 'the right thing' if they are given the right role models to choose from. Its just a matter of education. Thanks for doing such a beautiful job with this, friends...I love Jim's "pelicans & skimmers" into, and am honored to be included with these other writers I so much like and admire. It was fine seeing the Wild Read folks at NCTC in June, ans scribbling with Gavin in Vermont in July. Mark's comments hit to the heart of things.I might only add to "it's just a matter of education" this afterthought: "...and somehow coming to a solid understanding and genuine response to the natural limits that every expanding species must face." Yes, I must say Robert Michael Pyle is a respected lepidopterist. I started reading this book in August, within two weeks of the date when Robert Michael Pyle set out on his journey to follow the monarchs on their migration. The brilliance of his writing is in the way he captures the colors, textures, sounds, and smells--the FEEL--of the landscapes he's traveling through. The forum sounds like an awesome event.